Attract® is the Birders’ Choice Ultimate Blend formulated for the experienced hobbyist as well as the novice. 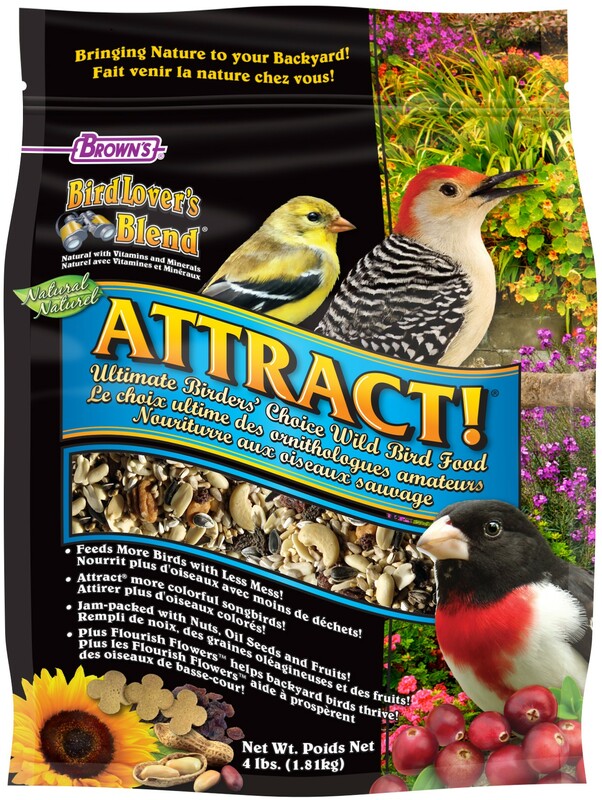 This advanced blend is designed specifically to attract most migrating and residential colorful backyard songbirds. 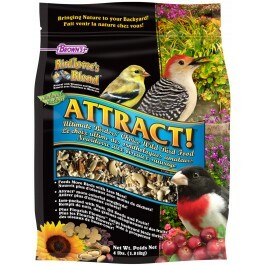 What makes Attract® the Ultimate Bird Food? We blended together only the most favorite foods songbirds love to eat! 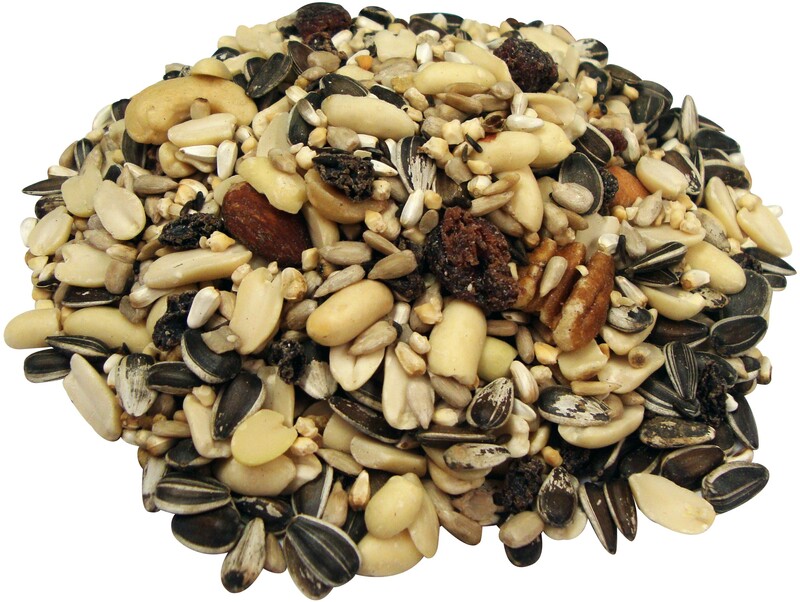 Then loaded it with energy-packed, prized peanuts and oil seeds which are the #1 choice foods for backyard birds. On top of that, we’ve added delicious fruits and our special nutrient-fortified Flourish Flowers™ that help birds survive and thrive in nature. Nuts, nuts and more nuts in Attract!® Songbirds of all shapes and sizes love energy-packed nuts and this mix has plenty to choose from. Your backward birds will flock to feast on these prized nuts. It’s loaded with energy-giving high fat oil seeds, the #1 choice of songbirds. A seed for every size songbird from striped to black oil sunflowers, safflower seeds, and thistle seeds can be found in abundance in this special mix. Flourish Flowers™ are fortified, nutrient-dense, edible flower-shaped food made from energy-rich wholesome ingredients that help birds survive and thrive in all seasons and regions. Peanuts, Sunflower Hearts (Dehulled Sunflower Seeds), Striped Sunflower Seeds, Safflower Seeds, Thistle Seeds (Bot. Guizotia Abyssinica), Mixed Feed Nuts, Raisins, Dried Cranberries, Wheat Flour, Ground Corn, Ground Oats, Corn Gluten Meal, Dehulled Soybean Meal, Soybean Oil (preserved with Mixed Tocopherols), Dicalcium Phosphate, Brewers Dried Yeast, Calcium Carbonate, Fat Product (Source of DHA), Fructooligosaccharide, L-Lysine, Salt, Vitamin A Supplement, Vitamin D3 Supplement, Vitamin E Supplement, L-Ascorbyl-2-Polyphosphate (Source of Vitamin C), Thiamine Mononitrate, d-Calcium Pantothenate, Vitamin B12 Supplement, Choline Chloride, Manganese Proteinate, Iron Proteinate, DL-Methionine, Zinc Proteinate, Sodium Selenite, Dried Pediococcus acidilactici Fermentation Product, Biotin, Folic Acid, Lecithin, Mixed Tocopherols (a preservative), Yucca Schidigera Extract, Rosemary Extract, Beta-Carotene.